We are particularly well known for using event-related potentials (ERPs), small electrical signals that are extracted from EEG recordings. We make extensive use of ERPs in our research on attention, working memory, and schizophrenia. In addition to using ERPs in our research, we also spend substantial time and effort developing and promoting ERP methods. 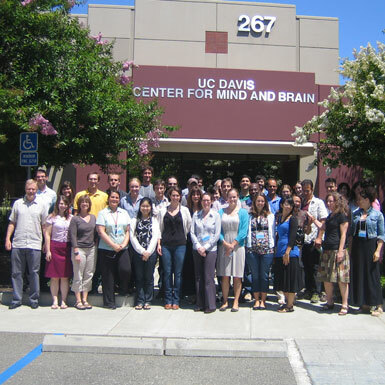 We lead the ERP Boot Camp a 10-day summer workshop on ERPs that brings 35 grad students, postdocs, and faculty from around the world to Davis every year for advanced training in ERP methods. We are also the developers of ERPLAB Toolbox, an open source Matlab toolbox that is used worldwide for the processing and analysis of ERP data. Our lab also makes extensive use of other methods. For example, we have developed behavioral and psychophysical procedures and quantitative models that are widely used to study visual working memory and related topics. We also make extensive use of eye tracking, and we occasionally use fMRI and MEG. Our goal is always to use the best method to answer the question of interest.